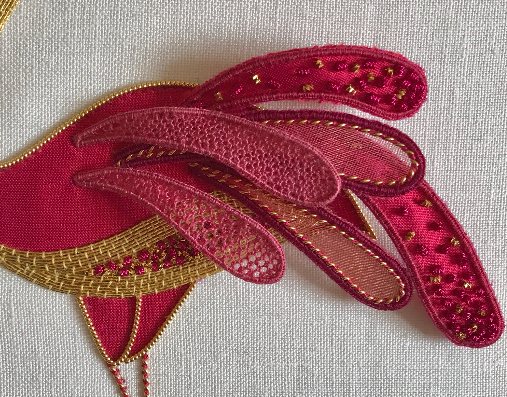 So in my last post I talked about how to work a stumpwork wired shape. This post is all about how to apply your 3D element to your actual design. 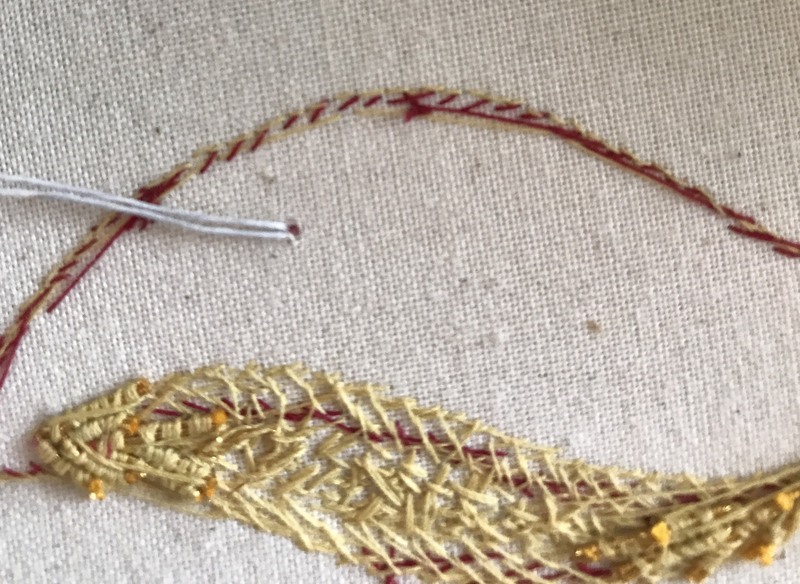 It depends on your design but usually you will have two layers of fabric to take your wire through. This is needed to give strength and stability to the piece. With my design I have the linen as the base fabric. 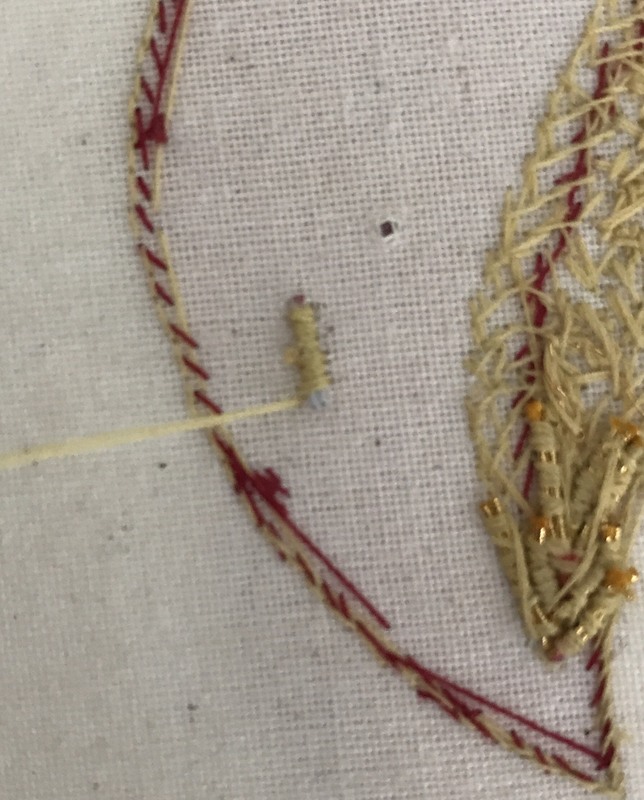 I have then applied a silk to the linen. Behind both of those fabrics is calico to act as the support for all the stitching. 1.) 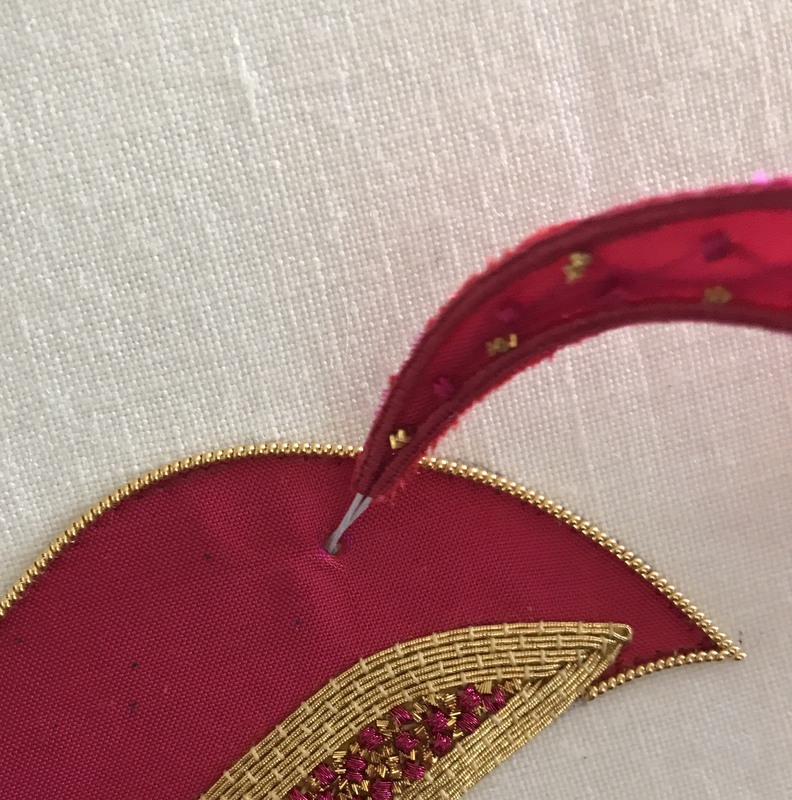 Start by making a large hole in the base fabric with the stiletto or a large Chenille needle if you don’t have a stiletto. 2.) 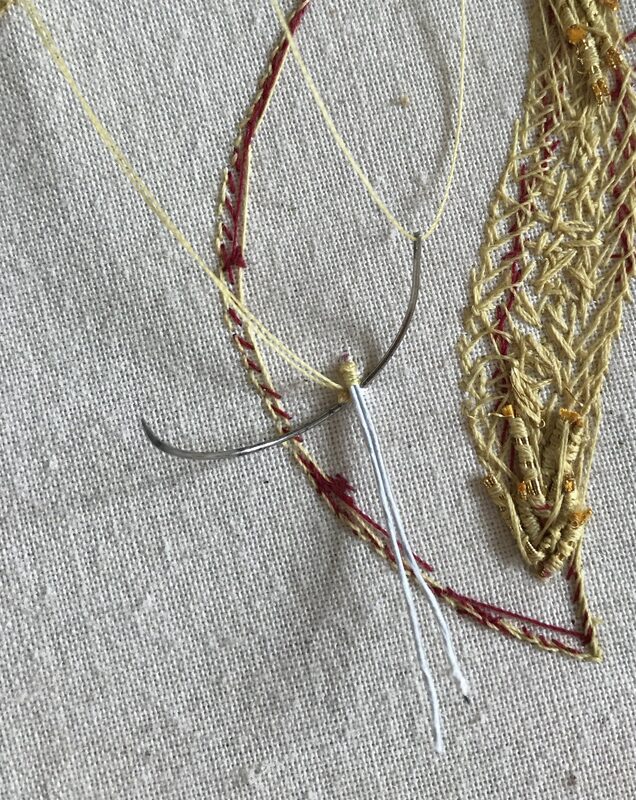 Take the wires from the 3D shape and take them through the hole that you have just made. 3.) Bend the wire back on itself so that it is sitting behind the shape (please excuse the other stitching on the reverse of this image). 4.) 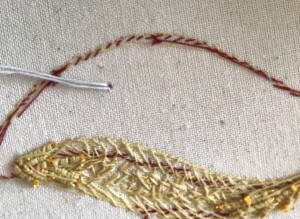 Thread a double sewing thread through your curved needle and wax it for strength. 5.) Secure the thread on the reverse of your work and close to the wires, take care to do this just through the calico so it doesn’t show on the front. 6). 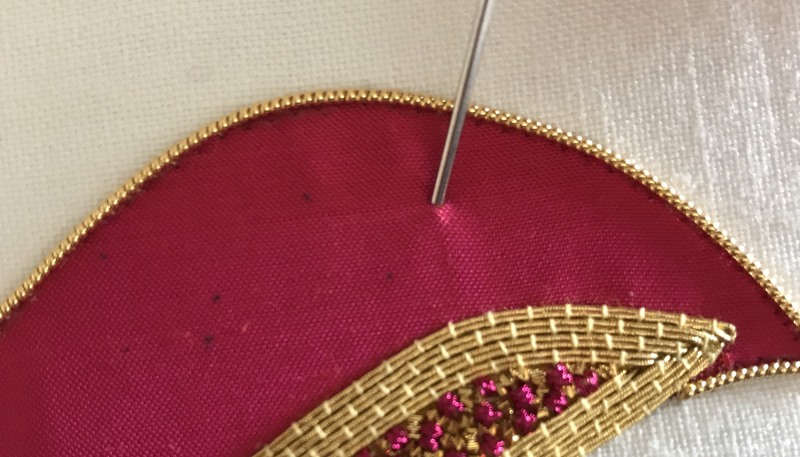 Keep tension on the wires so that they sit close to the front of your work, take the needle again, just through the calico (so that it doesn’t show on the front of your work) at the base of the wires and oversew the wires down. Keep stitches small and neat. 7). Repeat these stitches for about 5-7mm. The wire should also be pretty much covered. 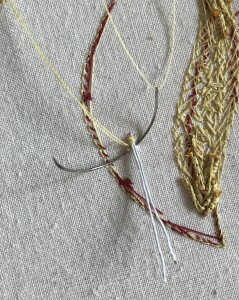 Once all the stitching is completed, the wires can then be cut close to the stitching and the double thread finished off. And there you have it, your wired shape should sit neatly and securely on the front of your embroidery. Remember you can manipulate the shape at the front to sit how you would like it to. As always I hope this blog post helps and if you have any questions then please don’t hesitate to ask.